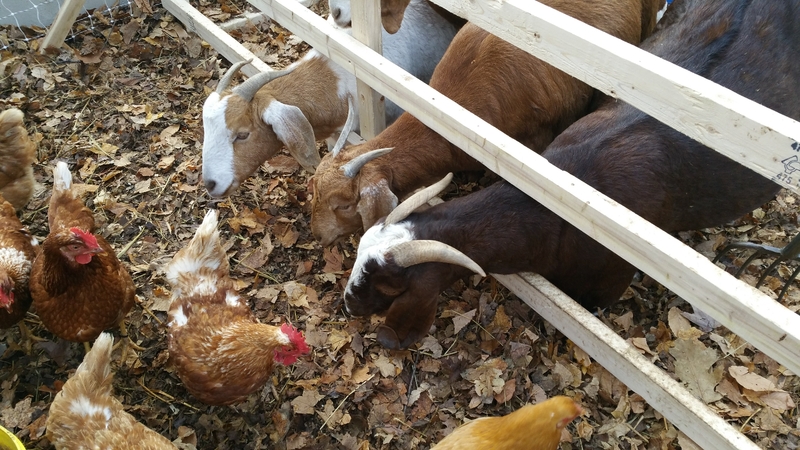 Goats and chickens enjoying their new winter accommodation together. Our “barn,” a large hoop house erected late this Fall (see Old Fashioned Barn Raising) is proving to be great winter accommodation for the goats and chickens. The last three of our pigs lived in it for a short while but they changed residence recently and now are in our freezers. You can take some of them home if you like; see Pastured Pork. Over the last few weeks we finished the ends of the hoop house and the lights have been installed. Here are a few shots of our barn and its residents. The “barn” as seen from the house. The ends have now been completed, the front with polycarbonate for esthetic reasons. 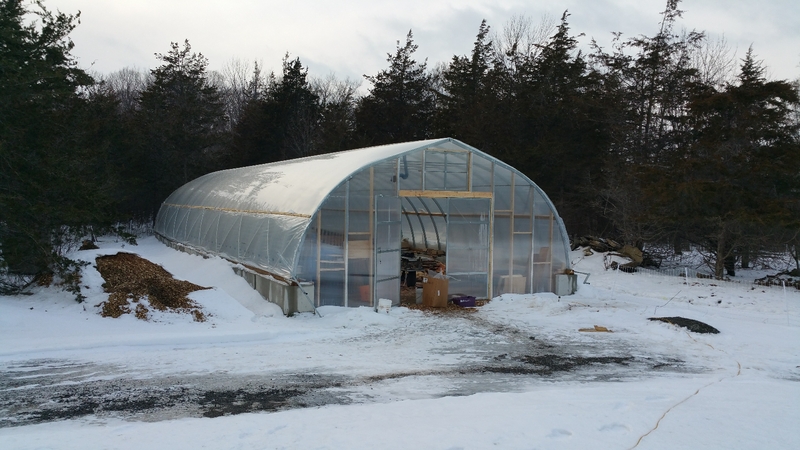 The cover of the hoop house is a double layer of plastic, with the two layers kept several inches apart by a layer of air maintained by a small inflater fan. You can see the slight “puffing” of the plastic in this picture. The layer of air is supposed to help the plastic last longer and also provides insulation. The inside layer is warm enough that we don’t have condensation raining down into the hoop house. We leave the back door at least partially open so that the animals are free to go outside whenever they choose. The goats especially like to be outside quite a bit, even at night sometimes if the weather isn’t too bad. We have had some reasonably cold temperatures (-19 degrees C) and some modest snow falls thus far and the goats like to go outside every day. 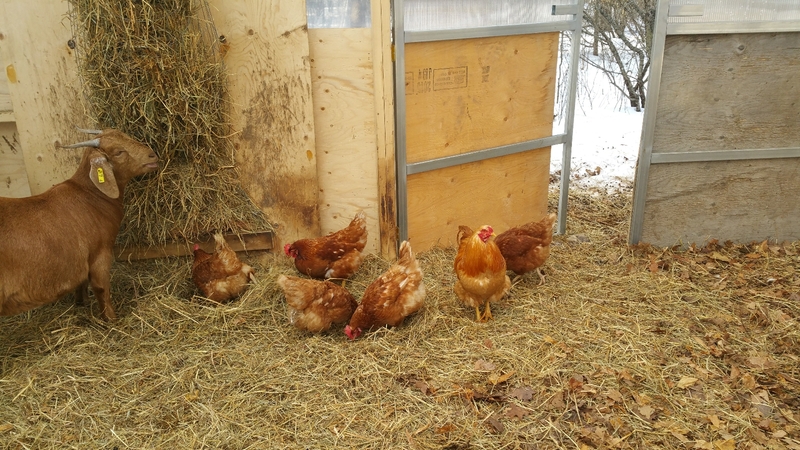 The chickens are less keen about walking in snow but do go outside sometimes. The open door also provides fresh air which we understand to be very important to the animals. As long as they are sheltered from the extremes of wind and precipitation, cold isn’t much of a problem but they do need to have plenty of air circulation. I was tempted to close the door last night when the coyotes started howling nearby but the goats didn’t seem concerned so I left it open. The chickens have the best of all worlds. 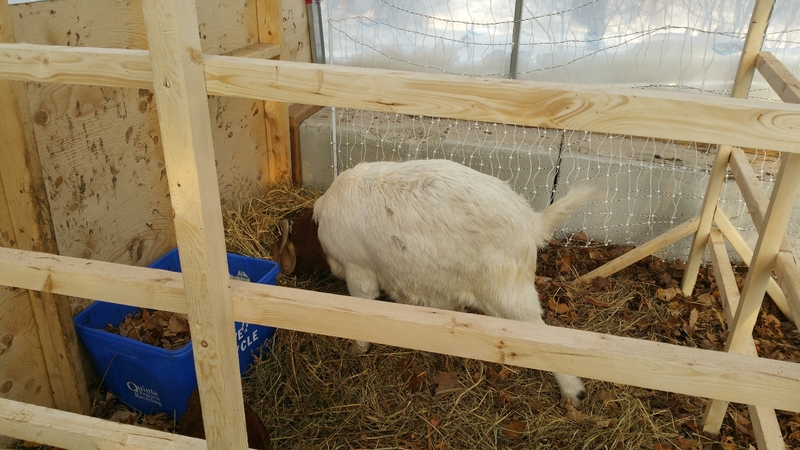 They have free run of the larger goat area and love scratching in the leaf and wood chip bedding and also eating the tender leaves that fall out of the hay feeder but they also have their own separate area. The goats would devour the chicken’s food, sometimes climbing right inside the chicken coop , if there wasn’t something separating them. 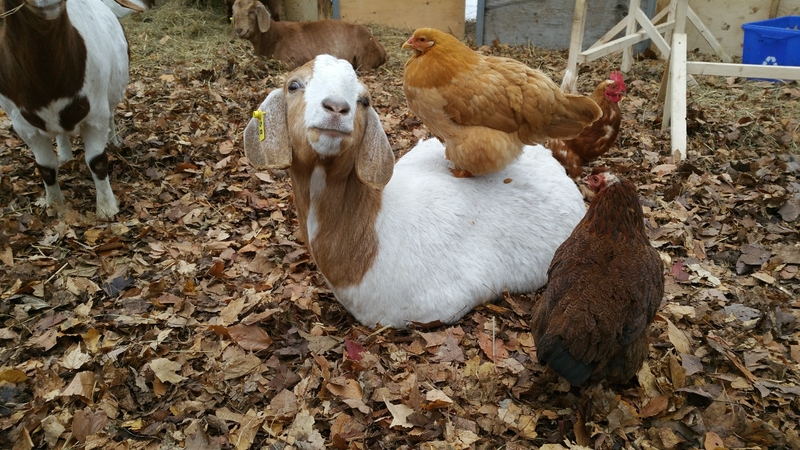 The goats regularly inform me that it is not fair that the chickens are allowed into their area to peck at their food but they aren’t allowed into the chickens’ area. “Angel” (yes, that’s what the grandchildren named her – but she is anything but) looks longingly at the chickens enjoying their feed. 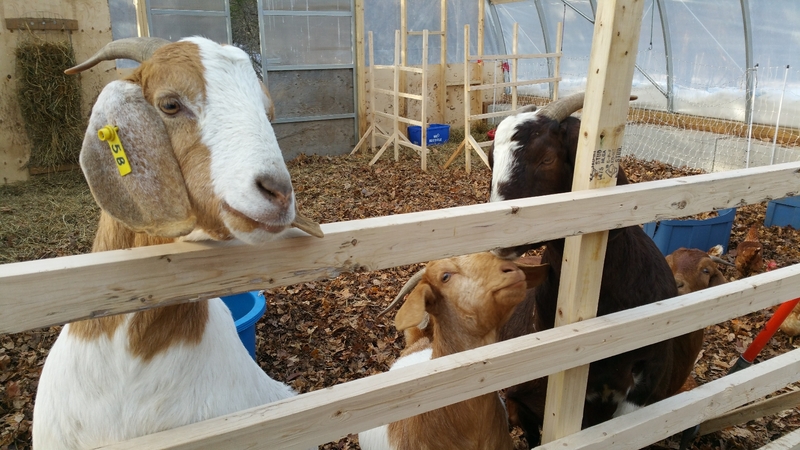 A pleasant surprise has been that the goats love eating their bedding. Yes, they like to devour quantities of the fallen leaves that we provide for their bedding even though they always have hay available in their feeder. We have huge piles of leaves so I did some research into their nutritive value and learned that fallen leaves do keep a significant proportion of the food value of the green leaf. That is a further benefit of our leaf collection that we had not anticipated (see the Bounty of Leaves post for other benefits). 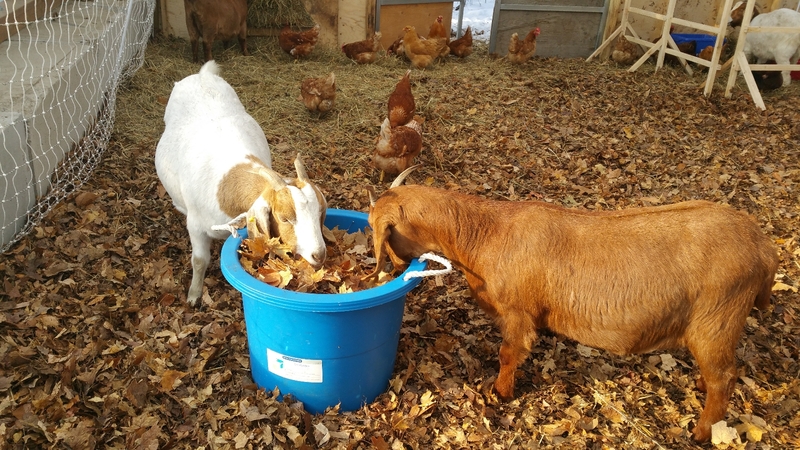 However, like people, presentation of their food is important to the goats and they really like it when I put the leaves into some tubs and totes for them. If they tip the container, the leaves end up in the bedding for which they were intended in the first place. We are enjoying the goats and their unique and winsome personalities. However, while they can be great with people, they often treat each other quite badly. The goat pictured here is called “Old One.” As her creative name suggests, she is quite old and is now lame in one leg and can’t defend herself. The others frequently drive her away from the food and often don’t even let her in the hoop house. So I built some portable dividers and made her a pen. She doesn’t stay in it all the time but she and I have an agreement that when things get tough for her she can go into the little pen and I will close it and give her one of the pans of grain, a tote full of leaves and a cake of hay. Once she realizes that the others can’t get at her she visibly relaxes and enjoys her food in peace. I know that many farmers would have got rid of an older goat like her by now but I am not willing to go there at this point and, I confess, it is not just because I would have trouble explaining it to the grandchildren. On another matter, some of you have been asking what has been happening with my Lyme disease. I am very happy and grateful to report that the symptoms began diminishing a few weeks ago and now seem to be completely gone. The infectious disease specialist in Kingston told me yesterday that he believes that the latest test results show that the Lyme disease is gone. Thank you for your concern and your prayers. Thanks for this delightful look into the lives of your animals, and I’m SO relieved to hear that the Lyme disease has been conquered. Well done! Here’s to a terrific 2017 for you!